Azerbaijan is a country with rich sports traditions. These traditions have a thousand-year history, a path of development with ups and downs. Today, the sport in the country is at its highest peak and Azerbaijani athletes’ performances and high achievements prove it. Great success was achieved in the field of sports under the leadership of President Ilham Aliyev in 2018, Minister of Youth and Sports Azad Rahimov said at an event dedicated to the sport results of 2018 on December 26. Rahimov noted that the attention and care shown by the head of state for sport creates the basis for victories in international competitions. The minister stressed that in 2018, the Azerbaijani athletes won 753 medals - 263 gold, 230 silver and 260 bronze medals in the world and European championships, cup competitions and international tournaments. Rahimov added that Azerbaijani athletes received 17 licenses for participation in the III Summer Youth Olympic Games in Buenos Aires, where they won seven medals - three gold, one silver and three bronze ones. He added that thanks to President Ilham Aliyev’s policy in the field of sports, Azerbaijan is recognized [worldwide] as a sports country. The minister noted that the progress has been made in the development of the material and technical base of sports as well. “There are 44 Olympic sports complexes operating in the cities and districts of Azerbaijan. The Olympic Sports Complex in Lankaran city was commissioned this year, and the construction of Neftchala, Terter and Goranboy Olympic sports complexes continues. The Beylagan Olympic Sports Complex is ready for opening, and the designing of the Yevlakh Sports Complex has finished. A new chess school has been built in the Gunashli settlement, a gym has been built and commissioned in the Buzovna settlement, the construction of eight gyms continues,” he said. 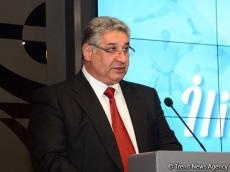 Azad Rahimov stressed that Azerbaijani athletes will face serious challenges next year. As a result of all-round development of the country, Azerbaijani sport has gone through significant improvements. The holding of international sporting events in Azerbaijan in recent years proves that the country is in the center of world attention not only as a country developing from a social and economic point of view, but also as a country where sports receives great attention. Among the notable international competitions held in the country, the first European Games, Formula 1 Grand Prix, Islamic Solidarity Games are worth mentioning. The Baku 2015 European Games, which were held from June 12 till June 28 played an important role in introducing Azerbaijan to the world. There was a total of 20 sports at Baku 2015: 16 Olympic sports and four non-Olympic sports. More than 6,000 athletes from across Europe are representing their nations over 17 days of competition. Following the 2016 European Grand Prix and 2017 Azerbaijan Grand Prix, Formula 1 2018 was the third championship in the streets of the Azerbaijani capital. As many as 20 drivers representing 10 teams, including such famous drivers as Lewis Hamilton, Sebastian Vettel, Kimi Raikkönen, Fernando Alonso and many others, struggled for the first place in the Baku City Circuit. Its length is slightly over six kilometers, with the widest part of 13 meters, and the narrowest of 7.6 meters. In 2019, the country will hold the fourth Formula 1 Azerbaijan Grand Prix on April 26 – 28. Another significant event was the fourth Islamic Solidarity Games that were held in Baku on May 11-22. Azerbaijan took the lead in medal standings at the Games on May 22. Azerbaijani athletes won 75 gold, 50 silver and 37 bronze medals. The country will certainly continue to please the world with its excellently organized events in the future.